It will come as no surprise to you that as a dance teacher, I believe the benefits of dance for children are endless! With news headlines regularly expressing concern about childhood obesity, both parents and schools are on the lookout for children’s activities that promote and develop a healthy lifestyle. With many activities to choose from, what is it that makes dance classes so beneficial for children? The physical benefits of dance lessons are obvious (and plentiful!). The physical act of moving your body causes your heart to beat faster and pump blood around your body, which helps to increase your cardiovascular fitness. In children’s dance classes, the repetition of exercises and routines helps to improve stamina and muscle memory. Regular dance lessons can help to strengthen muscles and improve balance whilst working towards developing flexibility and mobility. These are especially important for little bodies to help them become stronger, and to develop a good posture, alongside their co-ordination and motor skills. The best part is that children enjoy dancing to music they love, so they are often reaping all these physical benefits without even realising. Just as important as the physical benefits, the social aspects of a dance class also make it an important activity for children. Children learn to work with others who may not be in their class or may even go to a different school. Aside from the obvious benefit of making new friends, they learn how to communicate with other children, and how to share ideas with children who may not agree with them, whilst being kind to each other. They get the opportunity to regularly perform in front of their peers and get feedback and praise that contributes to a development in their self-esteem. Dance classes encourage children to learn how to follow instructions and use their problem-solving skills to approach tasks that they may find difficult. If I had to choose, my favourite benefit of dance for children is it’s positive impact on a child’s mental health. In lots of dance classes, children come into the class without their parent. For some children, this alone is a big step, which makes them feel a little bit exposed and anxious. Even for some more confident children, the thought of performing in front of their peers induces some level of anxiety. As a dance teacher, I find there is nothing more rewarding than gently encouraging a child outside of their ‘comfort zone’ and inspiring them to share their ideas or try something new. 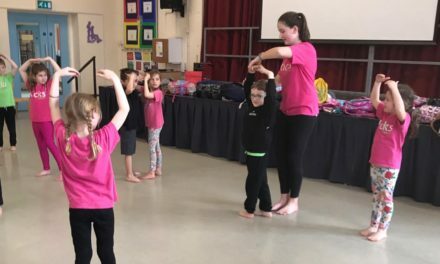 During a dance class, you are able to see children grow in confidence and realise that they are capable of doing something that had previously scared them – be that volunteering an idea to the rest of the class, asking a child they don’t know to be their partner or even just coming in to the studio without their parent. Things that may seem like small achievements, such as coming into class alone or showing the rest of the class a favourite dance move, can be instrumental in developing a shy child’s self-esteem and make a difference to their confidence. Dance classes provide the perfect opportunity for children to take part in a physical activity, which helps them to keep fit, but also to have fun and feel good – developing their social skills, creativity, confidence and self-esteem! for children aged 18 months – 11 years. Kicks has recently opened a sparkly new franchise in Reigate and Redhill! If you would like to run your own Kicks Dance business in your local area, please visit www.kicksdance.co.uk/franchising. NextWhat is our Kicks Mix class?